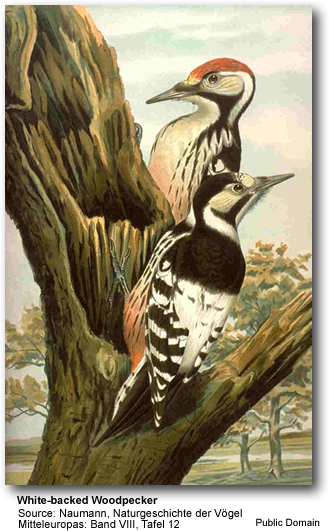 The White-backed Woodpecker (Dendrocopos leucotos) is a Eurasian woodpecker belonging to the genus Dendrocopos. It is the largest of the spotted woodpeckers at 24-26 cm long and has plumage similar to the Great Spotted Woodpecker, but with white bars across the wings rather than spots, and a white lower back. The male has a red crown, the female a black one. The nominate race D. l. leucotos occurs in central and northern Europe, with the race D. l. lilfordii found in the Balkans and Turkey. It is a scarce bird, requiring large, mature woods with plenty of dead wood. Numbers have decreased in Nordic countries. Ten further races occur in the region eastwards as far as Korea and Japan. In the breeding season it excavates a nest hole about 7 cm wide and 30 cm deep in a decaying tree trunk. It lays three to five white eggs and incubates for 10-11 days. It lives predominantly on wood-boring beetles as well as their larvae, as well as other insects, nuts, seeds and berries. Drumming by males is very loud, calls include a soft kiuk and a longer kweek.